My obsession with computers goes back to the days when I was child and just had to play another game of Tanks on Atari. Every time I get my hands on a new piece of hardware, I have to know if I can play games on it! Our typical gaming benchmark here at BIOSLEVEL.com used to be Unreal Tournament 2004, as it was at one point of the most technologically advanced gaming engines available on Linux. ...or not. While the game loaded to the menu screen relatively quickly, the VE-900's GPU just couldn't handle the game. It took me about two minutes to move the cursor from the center of the screen over to the "Close" button. I was hoping for a little more luck after the 1080p playback success, but this board is being marketed towards multimedia uses rather than gaming. Of course, one can always load up a game of chess or solitaire. Intel and AMD have been playing the multi-core game for years now, and the 64-bit game for even longer. However, the Nano X2 marks Via's first foray into both of these markets. I've owned a few Via products over the years, and I've always enjoyed being able to build a capable NAS or router that also consumed far less power than the computers I built for gaming. Truly, Intel's Atom processors invaded a space that Via has always catered to in the past. Judging by what I've seen up to this point, it looks like the Nano X2 is ready to take that market back. 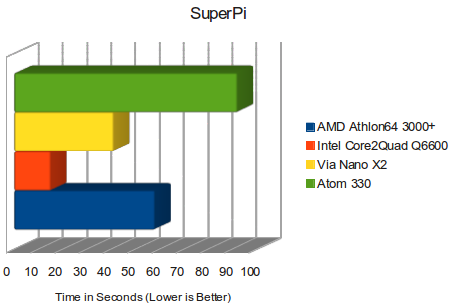 To test the processing power of the Nano X2, VX900 chipset, and RAM, I tested with SuperPi, calculating Pi to a little over a million decimal places. I was very surprised by the result, so I included several other processor's scores to show where the Nano X2 stood in the grand scheme of things. The VE-900 held its own ground in our SuperPi testing, beating a desktop-class 64-bit single-core CPU with a higher clock frequency. To look at this a little closer, I also used the Phoronix Test Suite to look at how fast the Nano X2 was able to compress different types of files. 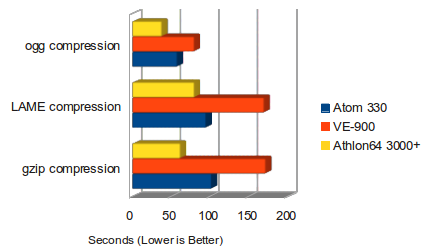 Again, the VE-900's Nano X2 holds up against the Atom. The question no one thinks about when it comes to computing power deals with who's going to pay the electricity bill. Unless you're playing the latest 3D games on your HDTV, there's little need to purchase multi-core CPUs and dual-bay videocards. I was impressed while monitoring the VE-900's power consumption through these tests. Via manages to pull ahead of Intel again. 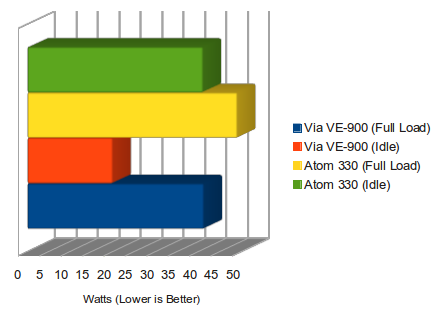 While idle, the VE-900 uses nearly 50% less power than the Atom-based system. Considering the Netbook and Desktop-class Atoms can sometimes use as much power as early dual-core processors, the VE-900's power consumption is even more impressive.